This recipe is a great way to use up your courgettes, but please don't overcook them, there's nothing worse than courgette mush. I prefer to just slice off the outer edges of the larger ones, discarding the wet core, and I scrape the seeds out of the little ones. The recipe originally came from The Cookery Year, and even though my copy is 30 years old, it's still one of my all time favourite cookbooks. I like to play around with the recipe, see my note below. Adapted from The Cookery Year. Notes: You can make this dish ahead, so all you have to do is pop it into the oven when ready. The original version uses Cheddar or Lancashire cheese, but I like Gruyère. Sometimes I add a few finely chopped red chillies on top instead of the paprika. Another version is to add some freshly ground breadcrumbs with the cheese for a crispier topping. Wash and dry the courgettes. Don't peel them, but cut off the stalk ends and if they are small slice in half lengthways with a sharp knife. I prefer to remove the seeds with a spoon. If the courgettes are a bit bigger, you can slice off the outer edges (3 or 4 slices lengthways per courgette) discarding the core. 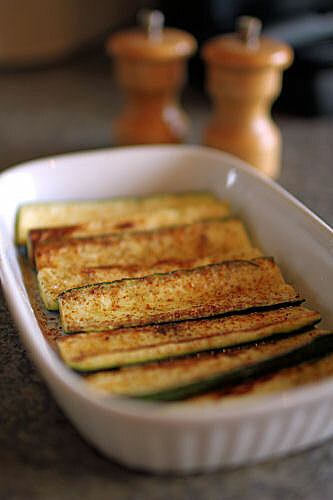 Melt the butter in a frying pan and fry the courgettes, cut side downwards, until lightly golden. 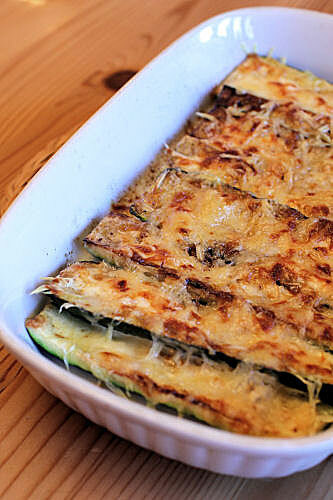 Remove the courgettes from the pan and put into an oven-proof dish. Season with salt and pepper to taste and a little dusting of paprika. 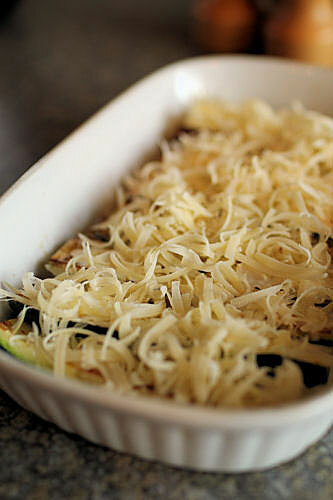 Sprinkle the grated cheese evenly over the courgettes and drizzle a couple of tablespoons of double cream over the top. Place the dish into a pre-heated oven and bake for about 12-18 minutes. You want the courgettes to remain firm, don't overcook or they will be mushy. If you want the cheese to be really brown and crisp, you can pop the dish under a hot grill for a minute or so when it comes out of the oven.